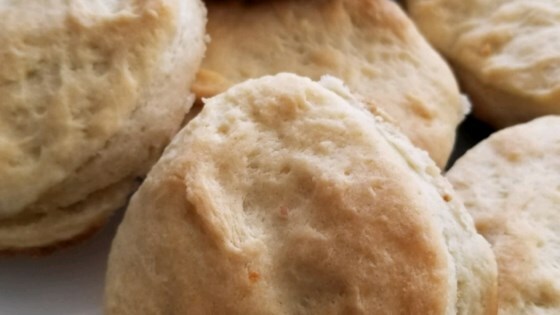 "This is a great recipe, different than the usual biscuit. Serve piping hot with butter, jam, or honey." The best biscuits!!! I used half whole wheat flour and added 1/4 tsp salt. Let the cut biscuits sit for 10-15 minutes before baking and they will be VERY tall and light! OMG THESE SERIOUSLY TASTE JUST LIKE KENTUCKY FRIED CHICKEN'S BISCUITS! MY FAMILY LOVED THEM, I ALSO FOUND TO BAKE AT A LOWER HEAT FOR LONGER HELPS COOK EVENLY. -TRY IT OUT! !